This telling of what happened on 15 April 1989 is made all the more traumatic as it allows the stories of some of the survivors of Hillsborough to be told. The book starts with fans getting ready to set off to the match. We read all the usual tales of meeting up with friends and relatives and looking forward to a good day, the anticipation, excitement and, unstated, the assumption that you will return home unharmed. We can easily take that for granted these days, with our all-seater stadiums and greater attention to safety. But it was so different in the 1980s. Football was regarded as “…a slum sport played in slum stadiums, and increasingly watched by slum people.” That was according to Rupert Murdoch’s Sunday Times, and generally believed because of the history of football related violence. There had already been incidents of overcrowding at the Sheffield Wednesday ground throughout the decade, and the ground itself was regarded by many fans as being unfit for purpose. Liverpool FC were taking 24,000 fans, but were given the smaller section of the ground, so it was a disaster waiting to happen. In the book, survivors tell of a lack of planning, the mass of fans building up outside, and people being allowed through turnstiles without their tickets being checked, which led to the tunnel being crowded. The police were obviously out of their depth but, worse, totally unsympathetic to the plight of those experiencing the initial crush. In fact, policemen were abusive with fans from the start. Inside the ground, one man recalls, the movement, the swaying of the crowd being part of the usual fun. But this quickly tuned into hell on earth. As the police opened the outside gate over two thousand fans hurtled into the tunnel and the central pens became death traps. We know what ensued, but it has never been told in such detail, and the details of personal suffering are heart wrenching. “The only part of my body that could move was my eyes.” “Stuck in quicksand, slowly sinking.” One man describes his near death experience, thinking about his pregnant wife and their expected baby. A woman says she realised she was holding onto the arm of a dead man for support. We know all about the horrendous conduct of the police, but to read the eye witness accounts is infuriating. When one gate sprang open because of the crush, people were forced back in. Fans were pushed back into the pens as they were climbing out. The lack of response by the police, plus the inadequate medical assistance and equipment have since been exposed but, again, to read it in detail is awful. Worst still, in its own way, was the biased, brutal interrogation of fans, including friends and relatives of those who had died. In contrast, the conduct of the fans, far from being drunken hooligans as claimed by the police and reported by the Sun and most of the media, was exemplary. It was the heroic fans who used advertising hoardings to stretcher the injured, attended to people on the field, and off-duty nurses who organised the triage in the gym where the dead and injured where taken. Similarly, it was the ordinary people of Sheffield who opened their houses so people could phone home to let their relatives know they were safe. 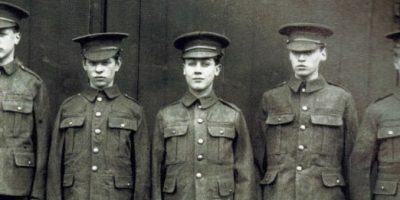 I well remember that afternoon and evening, as my son and his mates, reds and blues together, sat in our kitchen waiting to hear if their friend Neil was alive. Half a dozen 18 and 19-year-olds holding back the tears, hoping for good news that finally, thankfully, did arrive. Twenty-seven years later, the campaigning of the Hillsborough Family Support Group and Justice for the 96 lead to justice being served. 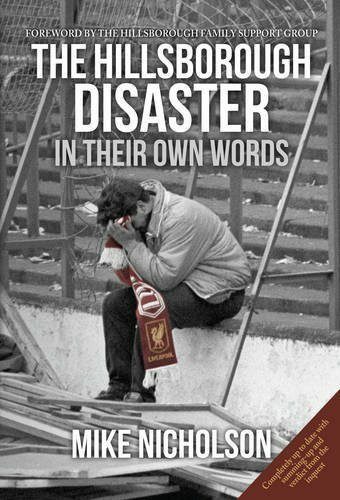 Mike Nicholson’s book tells us what it was like there on the day when 96 football fans, men, women and children were unlawfully killed and 766 injured. Read it and weep.